If you require professional sports training for your child, look no further than Premier Gymnastics & Cheer Academy. Over the years, our gymnastics instructors and cheerleading coaches have been providing top-of-the-line lessons to residents in and around Morganville, NJ. Whether your kid is interested in pursuing a career in sports or simply looking for new things to learn, trust us to have solutions for you. Our skilled and experienced sports instructors provide comprehensive and reasonably priced sports classes for a wide variety of ages and skill levels. We offer gymnastics classes that are structured to help students strengthen their body and improve flexibility as they learn new skills. Our academy also holds cheerleading classes to help boost self-confidence and develop essential skills. Premier Gymnastics & Cheer Academy reopened under new management in September of 2012 in a brand new 15,000-square-foot facility that is bright and clean. We also have a separate 3,500-square-foot facility dedicated to cheerleading. Conveniently located in Morganville, our school is a great option for families in Marlboro, Freehold, Old Bridge, and Central New Jersey. Let us lead your child to a bright future in sports. 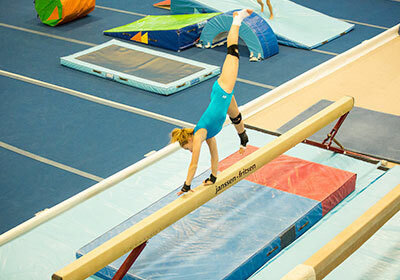 Enroll them in our gymnastics classes or have them join our competitive teams today. We also offer Parent Tots and cheerleading classes. Do you prefer more exclusive and hands-on sports training? Our academy also provides private lessons. For your inquiries, contact our gymnastics instructors and cheerleading coaches through the information provided.